Scores of women braved the very cold weather in the centre of Berlin to form a massive ‘X’ - the symbol for toxic chemicals - and call on the government to support REACH and phase out dangerous chemicals. 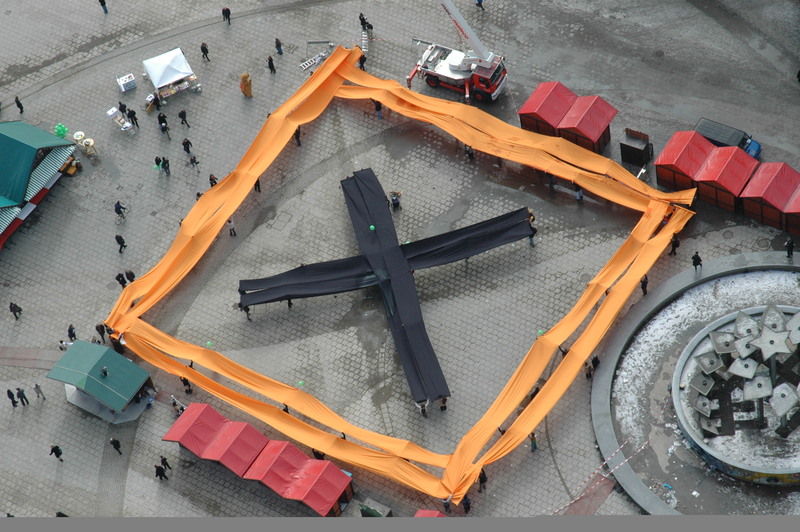 Scores of women and their male colleagues, braved the very cold weather in the centre of Berlin today to form a massive ‘X’ - the symbol for toxic chemicals - and call on the government to support REACH and phase out dangerous chemicals. 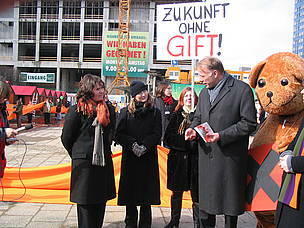 In an important show of support, Environment Minister Jürgen Trittin joined the action. "There should be a stronger REACH and the Ministry is working on this", he confirmed. In addition he explained that the German government was supporting two of the organisers’ key demands: More information on chemicals produced in quantities between 1 – 10 tonnes and the ‘One substance, one registration’ proposal. A coalition of women’s and environmental organisations launched its appeal on International Women’s Day to draw attention to the fact that "Women are particularly at risk from dangerous chemicals, through their work, at home, in the family or when shopping", as Sascha Gabizon, Director of Women in Europe for a Common Future (WECF) explained. "Most people just aren’t aware about chemicals", said Sonja Haider, WECF spokeswoman. "So we are raising awareness about what people can do for their health and how they can change their own behaviour as consumers". International Women’s Day is particularly significant in the fight to control hazardous chemicals because of the way that women are unwittingly being forced to pass on those found in their bodies when they are pregnant or through breast feeding. Recent scientific research has shown that some of the most harmful chemicals are entering unborn children when they are in their mothers’ wombs, even though the women themselves do not have detectable levels in their bodies. These may then affect the children as they grow up or as adults. "While chemicals are seen as a technical issue, when it comes down to health, it’s a personal issue", said Haider. "As mothers we are concerned about the health of our children. You try to do the best for your baby but you are harming the baby without realising it". According to a recent series of blood tests carried out on families in the UK, children were found to have as many artificially produced chemicals in their blood as their parents, despite their relative youth. In fact, there were cases where young children had higher levels of chemicals than their parents or grandparents. The organisers point out that chemicals may also interfere with conception as scientists have found evidence that chemicals may be to blame for increased infertility rates within Europe. Another key aim of today’s action is to influence public and government opinion around REACH. As the organisers insist. "REACH provides a unique chance to improve the protection for people and the environment against dangerous substances. Dangerous substances could be phased out". The chemical companies have to bear responsibility for making sure the chemicals they produce are safe, the organisers argue, "The producers have to prove that their substances are harmless before selling them on the market. We have to implement the precautionary principle", said Patricia Cameron from Bund für Umwelt und Naturschutz Deutschland (BUND). As WECF spokeswoman explained, "Germany originally supported a strong REACH and in Germany itself there was quite a good standard on regulating chemicals. Unfortunately Germany’s original approach to REACH has been weakened as a result of political and economic pressure. Germany has the biggest chemical industry in Europe, which has been very active in lobbying for amendments to REACH". "We need politicians who care for people’s health," say the organisers. "The presence of the Environment Minister is a sign that politicians are listening to people’s concerns". •Children and vulnerable groups should be the basis for testing for chemical safety. •Information on dangerous chemicals should be clearly defined and available. •Imported substances must be subject to the same regulations as those produced within the EU. •Chemical producers should share testing data (the so-called ‘One Substance – One Registration Proposal). Scores of women and their male colleagues, in the centre of Berlin to form a massive ‘X’ - the symbol for toxic chemicals. Norwegians join WWF chemical check up! 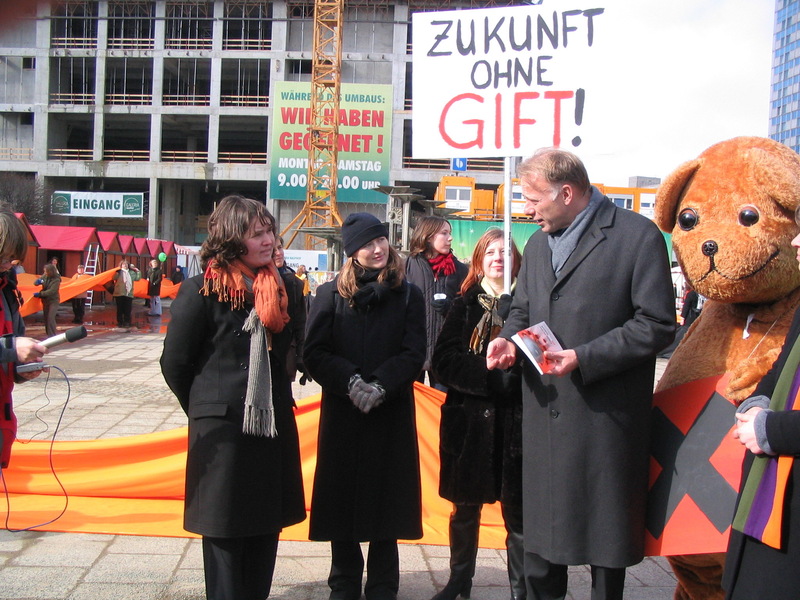 Environment minister Jürgen Trittin with Toxic Ted, Patricia Cameron (BUND), Sascha Gabizon (WECF)and Anke Lobymeyer (Hamburger Umweltinstitut).